All you have to do is place in a few of these freeroll tournaments, build up a small sum of money and head to the cash tables. If you invest time and effort with good bankroll management skills, there is no reason why you cannot set yourself up with a decent online bankroll to play with. Freeroll tournaments can be tricky. Due to the popularity of freerolls, you will often find yourself sitting in a tournament with thousands of players hoping to get a slice of the prize pool to add to their own accounts. A large number of these players will be there to see how far they can ride their luck; pushing in on any random hands without even attempting to play some "real poker". Initiating an online bankroll through freerolls can be a tedious affair, therefore I have compiled these top 5 tips for winning money from online poker freerolls. 1] Be prepared to accept losses. As negative as it sounds, you really have to be prepared to lose when playing in freerolls. The best player in the world will have trouble placing well in any of these freerolls because luck plays so much more of a factor than in any other tournament. If you focus too much on expecting to win, you will only be more disappointed and frustrated when you end up getting sucked out on for all your chips. 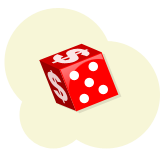 The best formula for online freerolls is to play well, and get lucky. You can't control luck, but you can improve your chances of winning by playing lots of freeroll tournaments. 2] Play a lot of freerolls and play them well. As mentioned above, we cannot expect to place well in all of the freerolls that we play in. By playing in more freerolls we are giving ourselves a better chance to finish in the money. You can increase the number of freerolls available to you by signing up at a number of different poker rooms. Almost all rooms offer freerolls, and they are happy for you to sign up just to play in them. So now not only do we have to play well and be lucky, but we also have to play often. 3] Sit tight at the start. The start of an online freeroll is always a bit of a frenzy. The luck riders will be straight into action, pushing all their chips in the middle with any two cards hoping for the quick double up at the start. This usually results in a rapid decrease in the number of players and you will find a few players sitting with monster stack sizes compared to the rest of the field. This is only natural, so don't think that you should have a large stack size like theirs to stand a chance of winning. Just sit tight wait for the good hands, and wait for your turn to double up. Do not be phased if you end up busting out early, just forget about it and head onto the next one, it's probably only around the corner. 4] Look out for the players sitting out. If you look around the table at a freeroll, you should notice that some of the players are sitting out and not playing in any of the hands. This is because they have signed up for the tournament, but have not turned up to play in it. This means that their blinds will be up for grabs for anyone who decides to raise pre-flop and doesn't come up against an opponent that is actually playing in the tournament. Keep your eye out for the players who are sitting out, so that you can raise and take their blinds when you feel that you will not come up against any resistance from an actual player. Make sure that you pick your spots carefully, and try not to get into any heavy contests with any of your opponents for these free blinds. 5] Be aware of when the dynamics change. As already mentioned, the start of a freeroll will be a complete frenzy. Players will be dropping out at a rapid rate and it seems like you will be in the money in no time. But you should realize that this pace will not be sustained throughout the tournament, and as the numbers decrease, the skill will increase. Great tournament players are able to quickly identify and adapt to changes in the game. As the luck riders drop out you will be left with opponents that have more of an idea of what they are doing, and they will now have their eyes on the money positions. This means you can play more tactically, and use a few more plays that you couldn't have used at the start, because these players will now actually be able to fold their hands. So be aware of when the transition from luck to poker starts to take place, because it will be time to change gears. These tips should prove useful for when you decide to play in your next freeroll. One key point that I feel I should highlight once more is the fact that you are going to lose far more of the freerolls you play in than win. Do not be disappointed if you have a long run of losses and come close to winning but fall at the final hurdle. Try to have as much fun as you can playing in these freerolls and one day you will end up walking away with that initial sum of money in your account. After all, what have you got to lose?